While some may find these queries intrusive, we don’t mind a degree of transparency, and while the digital world is this generation’s oyster, it is still uncharted territory to most. The notion that you can work online and travel full time? It’s baffling to many, many people. 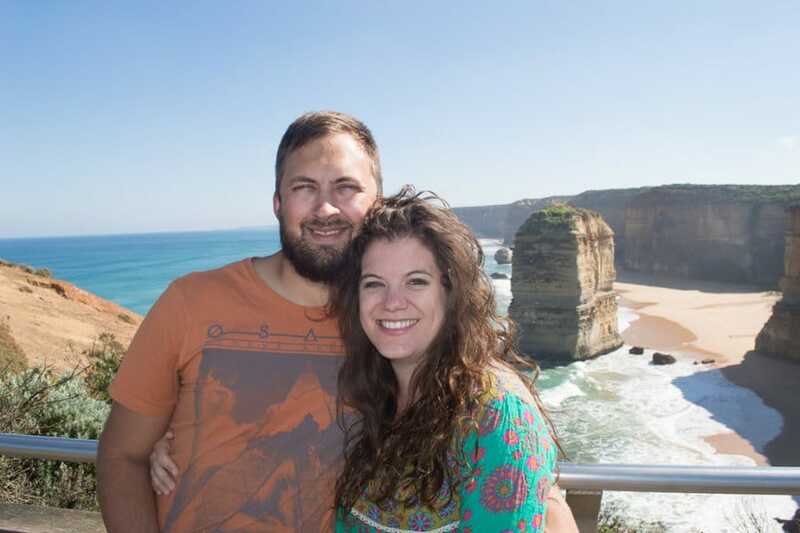 Because of this, we wanted to share a straightforward response of exactly how we afford to travel the world as a couple. That way, if the idea of full time travel or a nomadic lifestyle can perhaps seem a bit more attainable, even if you have no idea where to begin. How much did we save? How do we make money? How do we travel affordably? We’ll answer these questions for you, and next week, we’ll be showing you how other couples do it too. 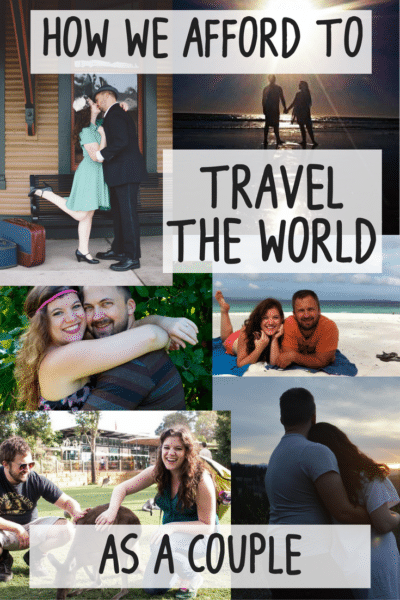 Hopefully, we can inspire you to live a life of adventure, and show you that it is entirely possible to travel the world as a couple or on your own. We Two Drifters are, well, a drifting sort at the moment. We often have no current home base, our journey is that of nomads, currently adventuring in search of amazing places and strong WiFi. One of the first ways to figure out how you and your partner can travel the world together is to talk about your overall goals; what you hope to see, do, and achieve. Traveling can take all shapes. While this post focuses more on long-term, extensive travel, many of the same tips apply even if you’re only seeking to take one or two big holidays per year. Your travel personality and travel style, however, will significantly influence how you use your money when traveling. Couples jetting off for a week of holidaying are likely to have more time to save prior to traveling, and are also much more likely to splurge on this rare getaway. Yet those planning for indefinite travel or gearing up for a location independent digital nomad lifestyle, like us, will have different goals and plans. Extreme budget travel – Do you want to travel fast, frequently, and as much as possible? Extreme budget travel is an option for you. For some travelers, the goal is to see as much of the world as possible, even if that means missing out on splurges or some of the more expensive attractions. That’s a totally cool goal, and you can join plenty of backpackers who are chillin’ in hostels on their way to that very dream. But even budget travel doesn’t need to be extreme. Maybe you enjoy deciphering travel hacks and earning free flights. If you love planning ahead and are willing to get super creative when it comes to making arrangements, you can extend your travel buck a heck of a lot. Honestly, it can be amazing how much and how far you can travel by doing it cheap. 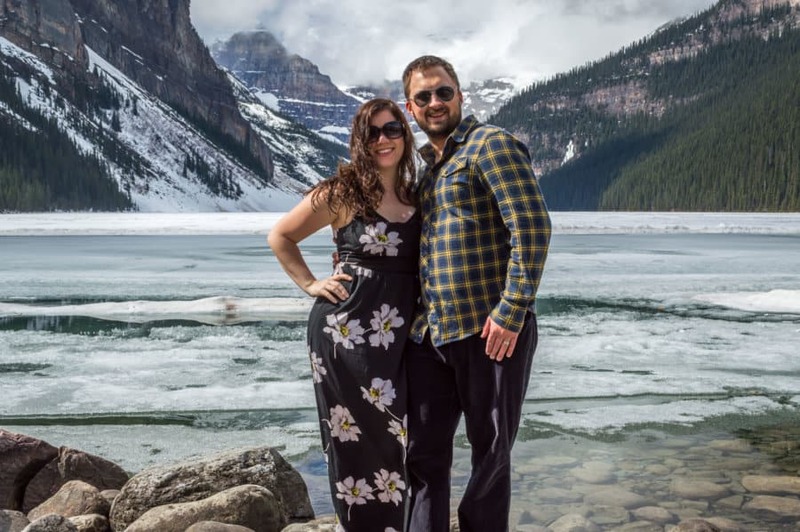 Of course, this approach isn’t for everyone—we’ve especially noticed that our 30-something selves crave more luxury and privacy—but for young couples craving to jet off—doing extreme budget travel is a very attractive and doable solution. Slow travel – For other adventurers, it’s not about traveling fast. These folks know they’ll never see everything, so they’d rather spend more significant time in each place. This is currently our own approach. Slow travel gives you the chance to live like a local, discovering those hidden gems that most tourists never get to see. And slow travel often allows for reduced living expenses and less frequent transport costs, giving you more time to save if you’re working on the road. Psst: One great option for earning money during slow travel is teaching English abroad. Check out this excellent how-to guide here. A travel break – Perhaps a travel break is your couples travel style? If you have a job that allows you to take time off, or you have an open period to take advantage of (such as right after college graduation), a travel break can satisfy your wanderlust and grant you the epic trip of a lifetime. This travel approach involves saving well in advance, planning ahead, and for those less financially blessed, may incorporate a helping or two of that extreme budget travel. The beauty of a career break, too, is having an end-date. For some, this provides security about the future and allows them to have more flexibility when traveling. If it’s a once-in-a-lifetime adventure, go ahead and splurge! An extended trip planned for the future – Sometimes people set out with no exact end date in mind. Or maybe they embark for a short time but their plans change. These intrepid travelers are inspiring. That sort of spontaneity is exciting. If this sounds like something you’d be into, the best method is to save save save for your trip, and allow yourself a potential buffer. It’s also a good idea to start investigating ideas for working abroad, working online, and more. Check the resources section below for some seriously inspiring posts about saving $$$ for travel. Well, doing so is completely possible, so we’re gonna break down OUR VERSION of how we live a travel lifestyle. It bears mentioning that there are many ways to fund long-term travel. Our approach is just one of those. 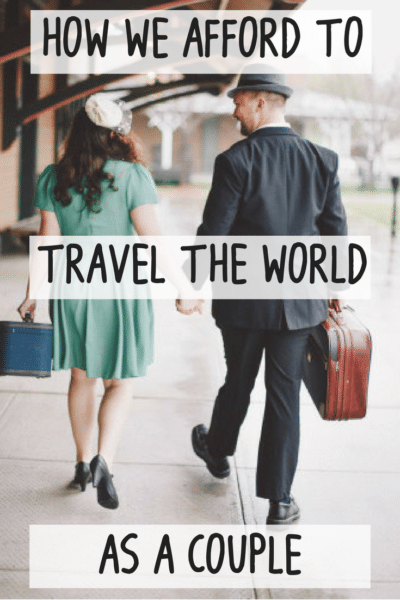 Here’s how it works for us, followed by some resources for how you can pursue a similar path of traveling the world as a couple. We own no car, house, or other sizeable asset. We don’t own furniture. What items we do possess actually fit into a compact car, and are currently stored at our parents’ homes. These are things like clothing, books, and mementos, nothing huge. While traveling, I’m carrying a single medium sized suitcase and large purse, Nathan carries a large backpack. With no major items, we don’t have a mortgage or car payment to manage. Without big payments like rent to worry about, our bills are generally quite low. We have health insurance, tax payments, credit card, and my student loan, but we don’t have a pricey cell phone plan, cable bill, car insurance, etc. If we wanted to live more luxuriously, the nomadic lifestyle wouldn’t suit us as well at the moment. But since our focus is travel, we’re happy to stay in basic accommodation, cook our meals at home, and miss out on some of the expensive tourist spots. This also means we’re very happy to travel to spots where cost of living is low. Parts of Southeast Asia, Eastern Europe, and South and Central America, to name just a few, are frequently very, very inexpensive. 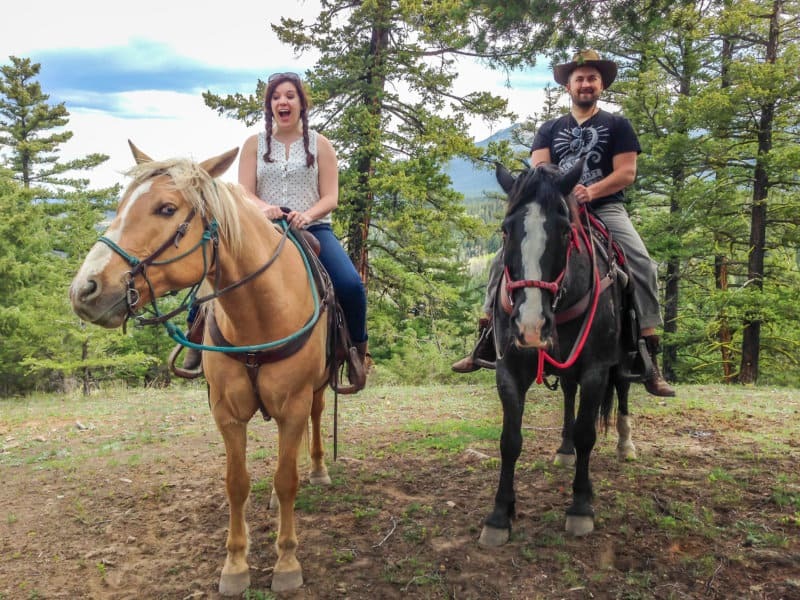 Travelers like us enjoy these places because you can do a lot on little money! So how do we make money? Probably our most frequently asked question! We earn our income through our online jobs. Nathan is a copyeditor. He works for a single editing agency as a remote editor, proofreading documents of all kinds and helping edit them for clarity and quality. I (Amy) am a copywriter. I am fully freelance, so I write for multiple clients. My work includes creating website content, blog posts, press releases, ebooks, and more, generally all geared to helping businesses sell their products/services or to improve their SEO. I also do freelance travel writing for various publications when I can, but this is a tough gig, and the need for copywriting is honestly far greater. These are our full time jobs, though we make our own hours (and sometimes end up pushing it over full time) and we can work anywhere so long as there is a strong, reliable Internet connection. Our secondary source of income (very secondary, at the moment) is through sponsored content on social media, as well as through a few different blog monetization processes. Because we have a significant social media following, particularly on Instagram, we sometimes partner with brands to show or review their products or services. We may be paid to create a photo or post that showcases the brand. Whenever we do this, we work only with brands we genuinely want to support and especially those we ourselves use. It’s always our goal to provide true benefits to our audience, so you won’t see us promoting something that has nothing to do with travel, lifestyle, or relationships. On the blog, we make money through affiliate marketing. When you click an affiliate link on our site (always disclosed) for something such as a product on Amazon, if you make a purchase, we receive a small percentage. This is a tiny contribution to our monthly income, but every bit helps! And of course, travel blogging offers benefits beyond the potential for income. We’ve been fortunate enough to work with a few hotels and other brands giving us complimentary stays or other items in exchange for blog coverage. It’s definitely awesome to get some amazing “free” stuff, but in all honesty, it involves work. Writing blog posts, publishing social media updates, and taking photos all add up to significant amount of time and use of our skills. So while being bloggers and travel influencers does help us travel the world a bit more, it’s something we put a huge amount of effort into. Because we work online, we are always traveling AND working at the same time. Aside from special occasions, we work M-F like most people. This makes slow travel ideal. If we went too quickly we’d never have time to enjoy a destination or truly explore. By traveling more slowly we give ourselves enough time to work, play, and relax. As an example, we spent 2 months in the UK recently and are currently planning on 2-3 months in Romania. As I briefly mentioned above, we’re happy to choose inexpensive spots, such as Romania, as stops on our journey. While cities like Rome or Paris are wonderful, they can be very expensive for budget travelers like us. Instead, we go for the less-touristy, more affordable places, which helps us out a lot. And, these somewhat off the beaten path spots are really amazing, and often soon-to-be-discovered by tourists, so we try to get there sooner than later! Housesitting is the ideal situation, and we try to land sitting gigs as much as possible. Otherwise, we opt for AirBnbs or seek longer term rental solutions. In Australia, we used the money we’d saved to buy a campervan, giving us a home on wheels for several months. We shop at thrift stores/charity shops A LOT. Need a winter coat? Charity shop. New dress? Thrift store. When traveling long term you have to change up your wardrobe a bit as the seasons turn. Spending your money at a thrift store can get you seriously amazing items for incredibly cheap prices. I’ve gotten some of my best stuff from these stores!! Being able to afford to travel the world as a couple is absolutely helped by the very fact that there are two of us. Two incomes are important, but when you’re splitting the cost of things, your travels vastly improve in many ways, too. A private room with AirBnb is often CHEAPER than 2 single beds in a hostel dorm, and, in our opinion, infinitely more comfortable. We do have goals for the future. We want to share that our lifestyle is constantly changing and evolving, too. We are working hard to continually increase our income streams. We’d love to start generating passive income and turn our Two Drifters blog into our full-time focus (pssst: this has become a reality in late 2018!) It would be an awesome dream to be bloggers who genuinely make money blogging!! Higher income would also allow us to gradually enjoy a few more luxuries, as well as pay off some of our debts (ahem, my very sad student loans). 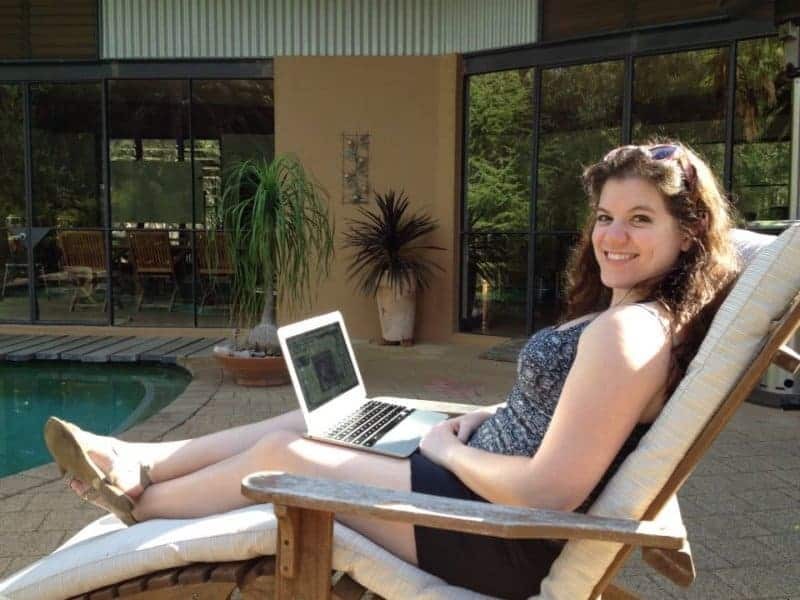 Work from anywhere using UpWork <—–also where Amy got started working online! Go beyond just working online! Discover how you can pursue a location independent lifestyle where you travel & work at the same time. Talk about livin’ the dream! Do travel bloggers actually make money? It’s hard, hard work to make a living as a blogger, and many bloggers make the bulk of their money from other gigs like freelancing, social media management, and more. But for many, a chunk of income does come from the blogs as well, or from their work as influencers on Instagram, Twitter, or Snapchat, among others. Travel bloggers make money through affiliate marketing, selling products like ebooks and courses, hosting ads on their blogs, accepting sponsored posts on their blogs or on social media, completing Instagram takeovers, etc. Saving money by traveling on a budget is key for many of us! 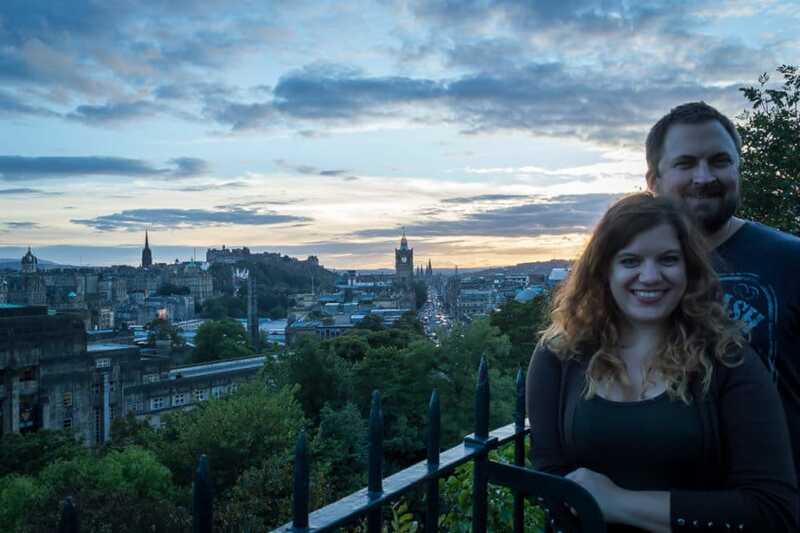 We love housesitting, and many other traveling couples seem too, also, because it’s a great way to travel the world and have free accommodation. 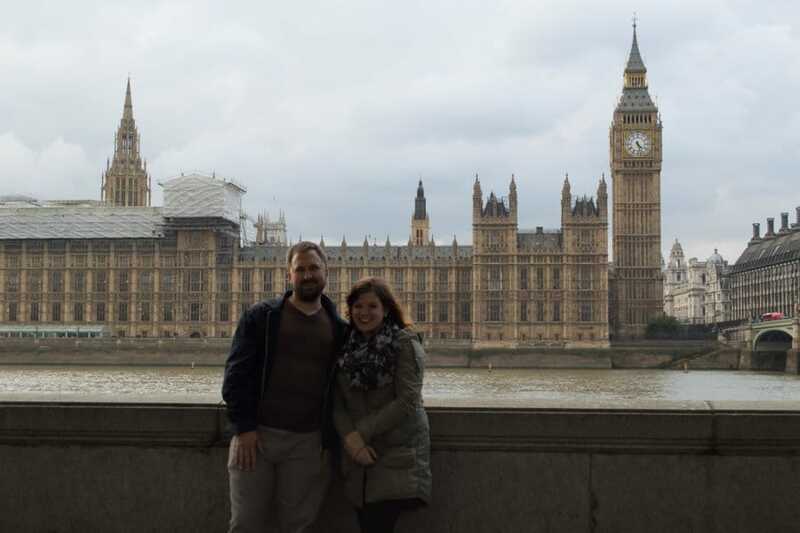 Teaching English abroad is a way many native English speakers make good money while seeing the world, and typically you just need to have a college degree. Here’s a great big resource on how to get started teaching English abroad. Some suggestions for how you can get your TEFL certificate inexpensively. Some countries have an especially high demand for English teachers. There are so many ways to travel the world affordably, and some folks have found really unique and awesome ways to do so. You could work as crew on luxury yachts (a great option for couples), find employment on a cruise ship, and more. Can families travel the world long term? You bet! Here’s how one family affords constant travel. Traveling as a couple is a wonderful adventure, but you know how money can be a source of tension in everyday living? The same goes for travel. When traveling often or living digital nomad-style, money might be more of a challenge; you may need to have frequent money meetings or discussions to make sure you’re on the same page. It’s important to have your goals aligned so you know what you’re spending, saving, and splurging on. A few more tips from things we’ve learned traveling together. If you’re based in the US and travel often, we can’t recommend banking with Charles Schwab enough. The free checking account lets you travel with no international fees on your card, and every ATM withdrawal fee is refunded to you at the end of the month. Schwab also offers great customer service and we’ve had no problem using our cards abroad these past few months. Also, if you’re starting to work online, don’t forget about taxes. They differ from country to country but as a digital nomads based in the States, we have to pay a fair amount of taxes on all of our freelance income. This includes all of our income sources. There are ways to reduce the amount of taxes you owe (including staying out of the US for 330+ days per year) but be aware of them and start saving and researching so you don’t get hit with an unexpected tax bill! The common thread through all of these stories, tips, and resources? In order to travel the world, you need to make travel a priority. If wanderlust calls you, there are almost always ways to make travel happen for you, but it takes determination and cleverness. At the end of the day…if we can do it, so can you! Got questions about how to travel long-term or about working online? We’re happy to answer them! Comment below or send us a message. I love reading them all too! It’s fascinating and encouraging—-so many people have figured out how to make travel work for them! This is soooo helpful, Amy! 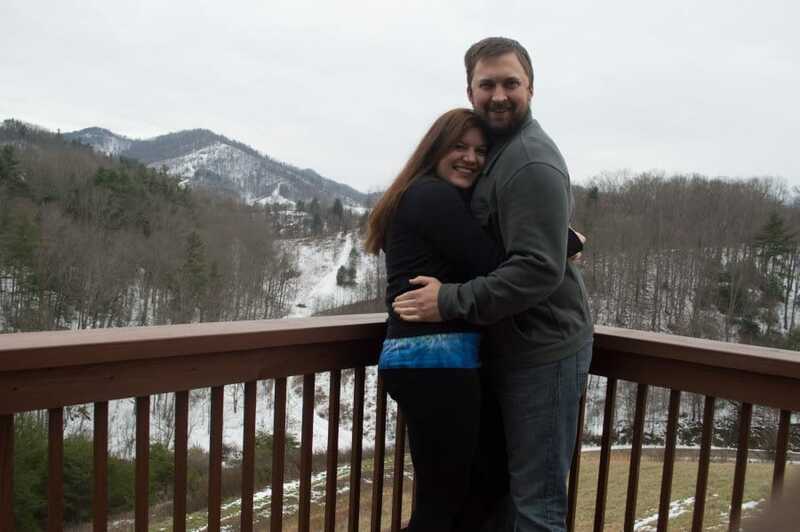 I love following your journey and aspire to travel as freely as you and Nathan do! Thanks for sharing such amazing content, I know this takes a long time to curate! I will definitely return, Amy! I am actually creating a profile on Upwork now and starting to apply for jobs. I am excited to pursue a career that will allow me to work online, earn money, and travel more. Thanks for your advice! As a couple back on the Road and hoping to make money this time, this blog is really helpful. We have done very fast paced low budget travelling before and now we have decided to slow it down like you and take our time in places. It is hard to get used to as sometimes we feel we should be moving on and experiencing new things but in the long term it will be worth it. We really hope we can be able to support ourselfs while on the road and make this a lifestyle choice. Thanks for all the helpful advice. awesome, guys. I really think you can do it! Slow travel is definitely the way to go. Even talking with other bloggers lately and we agreed that in many ways, to be a successful blogger, you have to not be traveling! haha. It really is a business that needs to be built. I know you’ll still have amazing adventures while you slow travel, and you’ll also be able to create more in-depth guides if you choose! Thanks for reading! 🙂 Where are you staying/traveling now? Fantastic and detailed article! And thanks for including Money Nomad as a reference. It’s always exciting to meet others eager to provide value and encouragement to digital nomads. Keep it up! Thank you Rob! Yes, I love sharing this stuff with people. Yay for digital nomads! as I write this from a coffee shop lol …. Ooft this is a great post! So glad you pointed out the blogging work is never free. yes!! Good to remember that free stuff requires a whole lotta effort…and makes your trip a very different one as well. I loved reading this post so much! So many awesome resources and I admire your transparency. Thank you! That means a lot. I think the resources are all super helpful! glad you liked all the tips!! And hey, you never know, you just might meet someone on he road. We did! That’s great to hear, Karin! It’s ok for it to be a work in progress…we make money but we’re definitely still figuring it out. The goal is to make more money but not have to work so hard. Haha! Where are you two now? Lots of great points and websites to check out in this post! Also, I definitely agree that traveling slowly and choosing more affordable destinations (Eastern Europe, South America, SEA) make it a loooot easier to travel longer on less money. exactly! Hence why we are in Romania for 2 months! I’m glad you enjoyed the article. I hope the resources will help a lot of people! I love hearing how people do it! Thanks for sharing. I guess our 6 kids kind of put our full time travel on hold until they get older:) I do look forward to the day we will travel full time though- probably about 7 years from now. I’m still saving this to work on! wow 6 kids Cathy! You’re rockin it! You definitely are making travel work for you, so you should be proud. Can’t wait to see what happens for ya! Love the post! We are the travel breakers right now ☺️ But, this will definitely help us in our future plans. We agree that you have to make it a priority. Thank you for all the resources! sweet! so glad you found it helpful. Where are you traveling currently? that’s so good to hear, thank you. Truly you just have to dive in and figure it out. It’s totally doable, and there’s no one path for everyone! Best of luck. Yes, let’s meet on the road!